John Deere is once again supporting Open Farm Sunday as the machinery sponsor for this year’s event, which takes place on June 5th, 2016. Since its launch in 2006, Open Farm Sunday has seen over 1.6 million people visit a farm and learn about the vital work farmers do. LEAF is estimating that 400 farms will open this year and between them, will welcome over a quarter of a million visitors. In the last three years, more than 80 per cent of visitors reported learning something new about farming, and one in five visitors had not visited a farm before. A series of Open Farm School Days will also run throughout June. They provide thousands of school children with the opportunity to visit a farm to learn more about where their food comes from and how it is produced. More information about Open Farm School Days can be found at www.farmsunday.org. Via the newly refreshed website, LEAF provides lots of features and resources to help host farmers put on a safe, engaging and enjoyable event and help inspire their visitors about all aspects of farming. John Deere contributes to this by producing 35,000 information leaflets for visitors to take home, with content for both adults and children, highlighting the latest John Deere technology and featuring some useful industry facts. 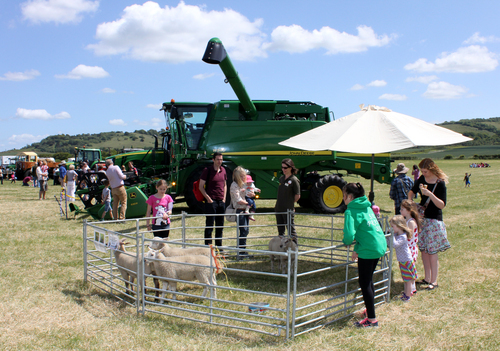 Further details of the event are available on the Open Farm Sunday website or you can follow @OpenFarmSunday on Twitter (#OFS16) or on Facebook at LEAFopenfarmsunday, while several new promotional videos are also available to view on YouTube.